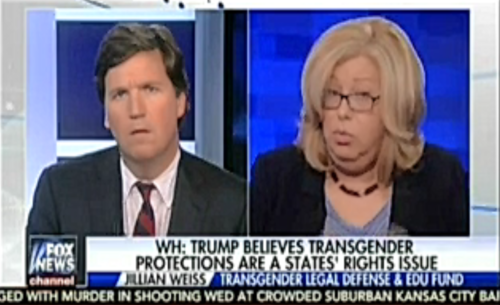 Tucker Carlson invited Transgender Legal Defense and Education Fund executive director Jillian Weiss to talk about bathrooms, and he generally refused to listen to her. Carlson responded that he could claim to be a woman the “tomorrow” and that there’s no way to tell if he’s sincere, obviously not having listened to Weiss’s answer. He went on to claim that there is $11 billion in gender-specific federal programs. Carlson did not say where he got this statistic and what programs it was referring to, or even the period of time it covers (the federal budget is commonly described in both one-year periods and ten-year periods). He continued to be snide, saying that since there isn’t a single, common standard used to determine gender identity by every organization concerned with gender, that transgender rights should be put on hold. The segment ended there. At no point did Carlson prove that he was a man or even described the universal criteria that we can use to determine whether he is a man.